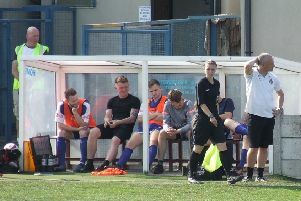 East Lancashire League Second Division promotion hopefuls Waddington knocked out First Division title contenders Rimington when edging a nine-goal derby thriller to progress in the President’s Cup. Waddington started brightly, determined to prove to their higher opponents that they were not overawed by the occasion. The home side’s carefully constructed game plan, however seemed in danger of unravelling after surrendering two early goals from easily defended situations, with the elusive Matt Bagot a constant threat for the away side. Waddington reacted well to this setback, and the character shone through. Robert Lloyd reduced the arrears with a fiercely-driven free kick. Graeme Kershaw produced an outstanding save to tip Luke Conti’s curling effort onto the bar, before a neat passing interchange between the tenacious Liam Gidlow, Phil Darnell and Gary Hickling caused panic in the Rimington box. The ball broke to James Taylor, and he swept the ball home to put the home side 3-2 up. Tempers, always simmering, flared in the second half, but Glen Dinsdale stabbed the ball home on 54 minutes after Langford had hit the post to bring the score to 3-3. The pendulum then swung further Rimington’s way as Gareth Hill put them 4-3 up. A red card soon followed for Jonathan Lincoln following a cynical thigh high foul on the outstanding Lloyd. A tactical switch saw Waddington push further men forward and on 80 minutes Taylor pinged a glorious diagonal ball to find Lloyd powering into the box, only to be brought down by a clumsy foul. Lloyd claimed his hat-trick from the penalty. Minutes later Lloyd delivered an outrageous lob to beat the stranded Kershaw and wrap up the scoring at 5-4, and seal an outstanding display from Waddington.